Newcomer wins in Kentucky. Retired Marine pilot Amy McGrath, one of several political newcomers to have big wins Tuesday, defeated Lexington Mayor Jim Gray in the Democratic primary for a House seat in Kentucky, CNN reports. 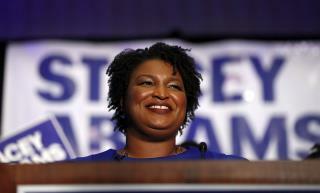 Democrats hope to flip the seat in November. A shift right in Texas. Conservatives won four out of five runoff GOP primaries in Texas, meaning one of the most conservative House delegations is likely to shift even further right, Politico reports. Among the winners was Chip Roy, Sen. Ted Cruz's former chief of staff. Political consultant Bunni Pounds, however, failed to defeat state Rep. Lance Gooden in the 5th District, despite support from Mike Pence and the Tea Party Express. Democratic outsider wins in Texas. In what the Washington Post describes as part of "an ongoing embrace by Democratic voters of non-politicians, women, veterans and nonwhite candidates," former Dallas County Sheriff Lupe Valdez won the Democratic nomination for Texas governor. Valdez, who is openly lesbian, would be the first Latina in the position. Air Force veteran Gina Ortiz Jones won the Democratic nomination for a House seat, and would be the first openly lesbian congresswoman from the state if elected. Score one for the establishment. The AP reports that national Democrats were relieved when activist Laura Moser, seen as too liberal to win a general election, lost a Texas primary runoff to former Planned Parenthood board member Lizzie Fletcher. The House seat she will compete for is one of 24 that Democrats aim to flip in November. Key win in Arkansas. State Rep. Clarke Tucker defeated three challengers for the Democratic nomination for a House seat, Roll Call reports. Tucker, a cancer survivor, has promised to expand Medicaid. He will face GOP Rep. French Hill, a hardline ObamaCare opponent, in November. with "...the support of national figures including Hillary Clinton..." doesn't sound like an "outsider" to me. The Democrats have nothing to offer. Just more pot to become legal in a few more states, open borders, higher taxes, more sanctuary cities, weak foreign policy, weaker military etc. This party must be destroyed. Hahaha. George Wallace must be rotating faster than the Super Collider.